*Indoor or Outdoor use, backyard, shed, camping, RVing etc..
*We stand behind the quality of our products and if you're not 100% satisfied with your purchase, we have a no hassle money back guarantee. Get Your Gaffer Power CLEAR DUCT TAPE Today! WEATHER RESISTANT INDOOR & OUTDOOR USE: PowerSteel Clear Duct tape is engineered as a see-through yet heavy duty weatherproof tape that expertly withstands rains & storms as well as humidity & sweltering summer days. 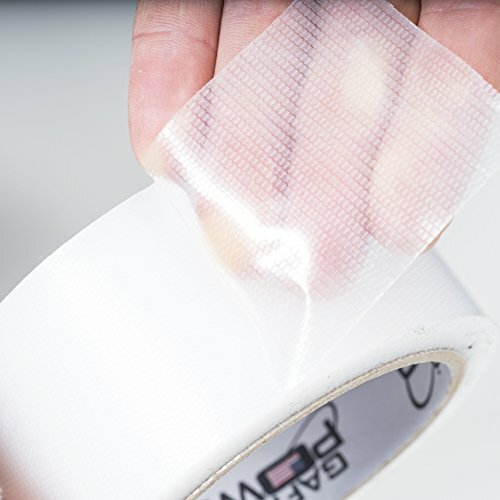 Our tape firmly sticks to rough & uneven surfaces of all kinds including wood, plastic, glass, vinyl, brick, stucco metal and rubber for a seal that locks & lasts.